Tumblr has fast become one of our favourite blogging tools, mostly due to its easy-to-use publishing system and unobtrusive social media features. Like the other blogging services we have reviewed recently, if you sign up for Tumblr you'll get your own subdomain. Unlike the other tools we've covered, though, you won't be ashamed to use it. The out of the box templates are clean and tasteful and can be customised easily. Even better, there are no widgets on the page telling users what service they're working with. 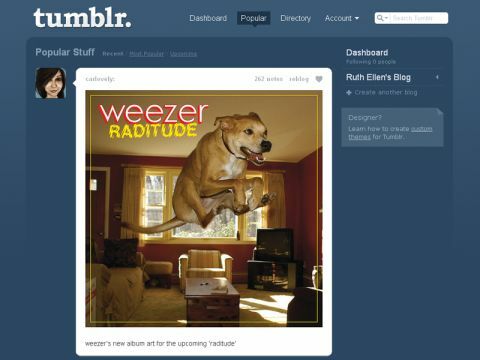 Tumblr describes itself as more of a scrapbook than a blogging system. Like Twitter, you can follow other users and view a stream of other people's posts using your own template. The simple publishing model adds one entry per page by default. Users can navigate easily back through previous posts if they like. Tumblr is also optimised for visual content, and the system makes it very easy to quickly post media snippets, audio, video, photos or plain text. In all, it's the perfect blog system for the more concise, more media savvy poster.